A quick break from holiday fun to post this interesting item that another sciencey relative put under the tree. 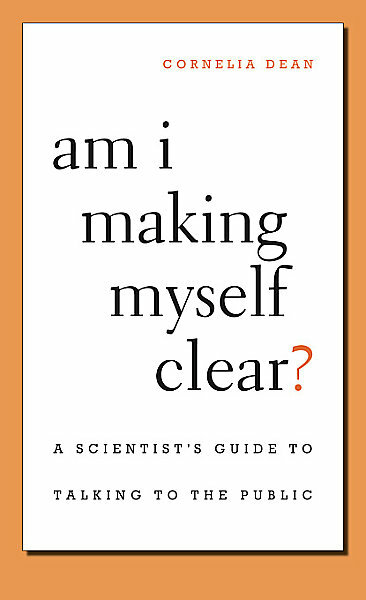 From the description: In Am I Making Myself Clear?Cornelia Dean, a distinguished science editor and reporter, urges scientists to overcome their institutional reticence and let their voices be heard beyond the forum of scholarly publication. By offering useful hints for improving their interactions with policymakers, the public, and her fellow journalists, Dean aims to change the attitude of scientists who scorn the mass media as an arena where important work is too often misrepresented or hyped. Even more important, she seeks to convince them of the value and urgency of communicating to the public. ← geographic considerations / why does the south lag? Thanks for the selection, I’ll try and give it a read.